The Denton brothers Jack, Don and Billy taken in 1919 after Don had been wounded in the war and the younger twins had both been POWs. At least cricketers can now focus on whether their team’s top-order batsmen manage to ‘leave’ the new ball judiciously and ‘remain’ at the crease. Exactly 100 years ago a new cricket season was anticipated – like the current one I would suggest – with even more enthusiasm and gratitude than usual. The First World War had ended the previous November. Within a few weeks the first-class counties were meeting at Lord’s to decide how best to re-launch the County Championship in the summer of 1919. Northamptonshire officials had every intention of taking part – and promptly launched an appeal for £3,000 to put the club’s finances back on an even keel. Adverts in the local press proclaimed that NCCC had lost 300 members during the war, and punters were urged to part with 24 shillings to swell the ranks and support the team. But what sort of cricket would be on offer at Wantage Road? Cue possibly the first of our game’s periodic (and deeply frustrating) crises of confidence, culminating in the recent ‘no-one-likes-cricket-any-more’ justification for The Hundred. 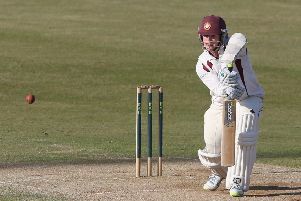 The majority of counties – including Northamptonshire – backed an experiment with two-day rather than three-day Championship matches. They reckoned a war-weary population wouldn’t have the appetite for the longer format, whilst clubs could function with fewer professionals and more amateurs – thus cutting costs. The editor of Wisden called it ‘a sad blunder’ while ‘Plum’ Warner thought it ‘a great mistake.’ Time would tell. 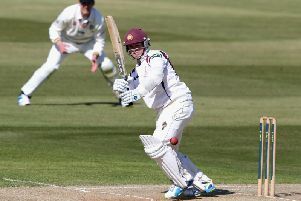 So who would be taking the field for Northamptonshire in the opening fixture against Lancashire on June 4? Certainly not the great George Thompson. He was still recovering from a serious illness at Netley Hospital near Southampton. For a time it wasn’t even certain he would live. And what about the famous Denton brothers from Rushden? The twins Jack and Billy had been taken prisoner by the Germans in May 1918 and incarcerated on a bleak island in the Baltic. A year earlier their younger brother Don lost part of a leg in the fighting but returned to the County game briefly in 1919 and 1920 with an artificial limb and heaps of courage. There was no obvious captain either. Several pre-war skippers were sounded out and eventually ‘Tim’ Manning (who led the side between 1908 and 1910) took charge for the opening match before Joseph Noble Beasley, by his own admission a better rugby player than cricketer, shouldered the burden. His task wasn’t made any easier by those new playing hours – often 11.30am to 7.30pm on both days. For the away match at Derby in mid-June the Northamptonshire players had to board a train at 7.20am on the opening day, ahead of (as it transpired) 93 overs in the field and then an unsurprisingly disastrous short session with the bat. ‘If any of them need convincing that half-past-seven cricket is a mistake they will certainly be convinced before stumps are drawn at Derby on Friday night,’ noted a local reporter. Nor did the later finishes attract the hoped-for crowds to watch after work. In August the counties voted to revert to three-day cricket for 1920. Somewhat less fraught was the return of local league cricket in the first summer after the armistice. Some of the credit for that should go to Sir Arthur de Capell Brooke, President of the Kettering & District League, who seized the initiative in March 1919 and invited club representatives to take tea with him in order to discuss prospects for the coming season. A month later they met again at the George Hotel in Kettering to lay their plans in detail with most of the familiar names – the likes of Rothwell, Burton Latimer, Earls Barton, Wollaston, Rushton, Gretton, Geddington, Great Oakley and Weldon – all reportedly raring to go. Northampton Town League was also revived, although in contrast to the ‘K&D’ a number of new clubs joined the pre-1914 survivors. One of their biggest problems was where to play. Northampton’s Racecourse had been transformed into a huge military camp and would require a lot of work to make it fit for cricket again. But a number of Saturdays were earmarked for league cricket at the County Ground and AJ ‘Pat’ Darnell – President of the Town League as well as Hon Secretary of NCCC – hoped local enthusiasts would support those games. men serving in county regiments to represent those same counties in Championship cricket. In truth it’s hard to read through the newspapers of 1919 without becoming a tad emotional. At Kettering, a match was played in September between the Town club and members of the Wright family – several of whom represented Northamptonshire. It replicated a similar contest in 1913, and all the Wrights who took the field then were around to do so again six years later. Countless other families around the county were less fortunate. Those who did come home couldn’t wait to get into whites again. Every cricketer – especially in April – knows how they felt.